Located in Huangzhong County, 26 kilometers from Xining, Kumbum Monastery was built during the reign of Emperor Jiaqing of the Ming Dynasty (13681644). Covering an area of 40 hectares, the monastery is an ancient building complex in the Han style, consisting of halls, chapels, the temporary dwelling place of the Panchen Lamas, and rooms for monks. 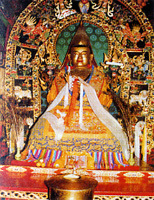 It is under national protection because it is the birthplace of Tsongkhapa, founder of the Ge-lug-pa (or Yellow) Sect and one of the six largest monasteries for the Ge-lug-pa Sect of Lamaism in China. The monastery has a rich collection of relics. Every year, four grand religious activities are held here between the 14th and the 15th day of the first month and the fourth month, the 7th and the 8th day of the sixth month, and the 22nd and the 23rd day of the ninth month, on lunar calendar.